Lewis B. Combs was co-creator and director of World War II’s legendary fighting Seabees, who rapidly built docks, landing strips, and other critical facilities in every theater of operation during the war. A distinguished naval officer for 31 years as a leader in the Navy’s Civil Engineer Corps, Rear Admiral Combs oversaw an unprecedented construction program to provide the public works and utilities for Navy operations in the United States and for a far-flung network of bases overseas. In 1942, this work included organization of the Naval Construction Battalions (CBs), known as the Seabees, an entirely new branch of the naval service that expanded to 250,000 by war’s end. 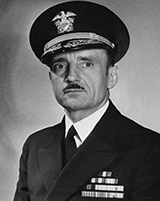 He played a major role in the development of floating dry docks, which enabled the quick return to battle of impaired ships and saved many American lives. Upon his retirement from active duty in 1947, Combs joined the faculty at Rensselaer, where he served as head of the civil engineering department for 15 years.